Currently, the Army contends IBCTs face a number of limitations: The IBCT lacks the ability to decisively close with and destroy the enemy under restricted terrains such as mountains, littorals, jungles, subterranean areas, and urban areas to minimize excessive physical burdens imposed by organic material systems. 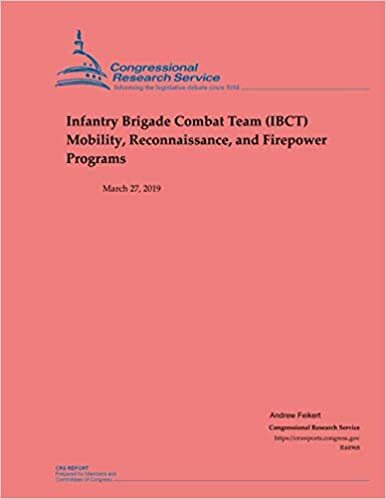 The IBCT lacks the ability to maneuver and survive in close combat against hardened enemy fortifications, light armored vehicles, and dismounted personnel. IBCTs lack the support of a mobile protected firepower capability to apply immediate, lethal, long-range direct fires in the engagement of hardened enemy bunkers, light armored vehicles, and dismounted personnel in machine gun and sniper positions; with all-terrain mobility and scalable armor protection; capable of conducting operations in all environments. To address these limitations, the Army is undertaking three programs: the Ground Mobility Vehicle (GMV)/Infantry Squad Vehicle (ISV), formerly known as the Ultra-Light Combat Vehicle (ULCV); the Light Reconnaissance Vehicle (LRV); and the Mobile Protected Firepower (MPF) programs. These programs would be based on vehicles that are commercially available. This approach serves to reduce costs and the time it takes to field combat vehicles. The GMV/ISV is intended to provide mobility to the rifle squad and company. The LRV would provide protection to the moving force by means of scouts, sensors, and a variety of medium-caliber weapons, and the MPF would offer the IBCT the capability to engage and destroy fortifications, bunkers, buildings, and light-to-medium armored vehicles more effectively. The FY2020 Army GMV budget request for $37 million in procurement funding supports the procurement of 69 GMVs for the U.S. Army Special Operations Command and 15 ISVs for the Army. The FY2020 GMV Research, Development, Test & Evaluation (RDT&E) request is for $3 million to support operational testing. The Army did not submit a FY2020 budget request for the LRV program. The FY2020 Army MPF budget request for $310.152 million in RDT&E funding supports the continuation of rapid prototyping efforts and the completion of 24 prototypes.